The U.S. economy continues to slowly improve as the unemployment rate fell below 8 percent for the first time in four years, though employers await signs that the global economic recovery has taken root before hiring at a faster pace. Recent developments helped stabilize the financial situation in the eurozone, which should pull the trade area from the edge of recession by early next year. Additionally, the impending “fiscal cliff” has begun to stir lawmakers in the Senate, though a deal to avoid the huge tax increases and spending cuts will likely wait until after the election. Together, these forces have provided employers some impetus to hire, though sluggishly growing consumer demand will keep job growth tempered for the next several months. The BLS revised July and August’s employment gains up by 86,000 jobs during the most recent report, helping take the sting out of a lackluster September reading. Employers added 114,000 jobs last month, however, average gains in the third quarter were nearly 150,000 per month, well above the 67,000 monthly job additions in the second quarter. The government sector, which has been a drag on the economy for several months, added 75,000 positions during the third quarter, including 45,000 spots in August after revisions. Seasonal adjustments, which can be difficult to discern, are the likely contributor to the rise. White-collar sectors continue to perform well as both professional and business services and financial activities created 13,000 positions. The strongest gains were in the education and health services sector, with 49,000 new jobs, while trade, transportation and utilities employers expanded head counts by 25,000 positions. The largest surprise in September’s jobs report was an unexpected 30-basis point drop in the unemployment rate to 7.8 percent. According to the household survey, 900,000 people found positions in September, the largest increase in nine years. Also, labor force participation jumped by 400,000 workers, signaling a more positive outlook among long-unemployed workers. 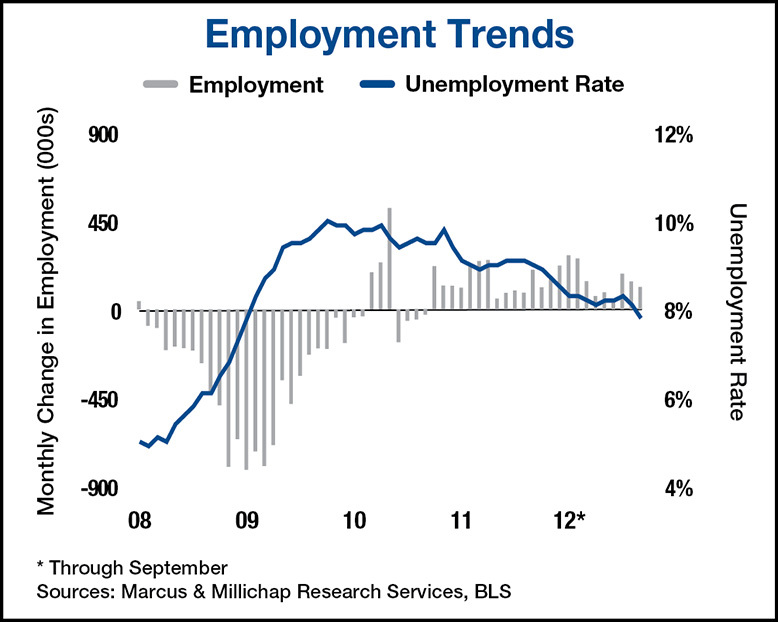 While the household survey often displays high levels of volatility, September’s sub-8 percent unemployment rate should help boost consumers’ psyche. Individuals will continue to postpone long-term planning when considering a home purchase due to the lackluster economic recovery and need to stay relatively mobile to find employment. As a result, national apartment vacancy will tick lower in the fourth quarter, finishing the year at 4.4 percent. An improving economy and low interest rates in 2013, however, could spark additional momentum toward homeownership, putting upward pressure on national apartment vacancy. The manufacturing sector, which helped lead the nation out of the recession, posted a second consecutive monthly decline in September. Over the past two months, 38,000 jobs have been lost as an economic slowdown in the eurozone reduced demand for American exports. Nonetheless, local demand will help boost operations in the industrial sector, albeit modestly. At year end, the national industrial vacancy rate will fall to 11 percent, supporting asking rent gains of 1.7 percent and effective rent growth of 2 percent. This entry was written by marcusmillichap, posted on October 5, 2012 at 8:58 pm, filed under Research and tagged Commercial Real Estate, Jobs. Bookmark the permalink. Follow any comments here with the RSS feed for this post. Trackbacks are closed, but you can post a comment. WELL SAID JIM AUSTIN; I’D LIKE TO SEE A “JIMMIE THE GREEK” PROTEGE POST THE ODDS AGAINST YOUR “GUESS”; U R SUCH A GENTLEMAN. Agree. Jack Welsh was right. #s were made up by the Chicago Machine. They dont add up. Biggest Scandal since the Obama Phone and the Labor Dspt’s deal to let Lockheed Martin slide on the 127,000 layoff notices due to sequestration. Most corrupt adminsitration since the TeaPot Dome Scandal.